State education officials released the results of the second year of the troubling A-F school grading system Wednesday morning and just like the results last year, they are more of a statement about poverty than a meaningful measurement of how well students are doing at school. Just over 98 percent of the schools that received an F grade have more than 50 percent of their students eligible for free and reduced lunch while 94 percent of schools that earned a D had a majority of students who qualify for the federal lunch program. Eighty percent of the calculation of the letter grades is based on student test scores while only 20 percent is based on much the scores improve from year to year. That means no matter how much students at a low income school improve, it’s very difficult for poor schools to receive a higher letter grade. Even many Republicans and conservative think tanks openly acknowledged last year that the formula should be changed to increase the weight of year to year improvement, but legislative leaders refused and so once again stigmatizing F’s and D’s are being slapped on most low-income schools regardless of the progress they are making. The punishing and unfair system comes at a time when the grades might have even more negative consequences. Rep. Rob Bryan is working on legislation behind the scenes in the General Assembly that could turn over poorly performing public schools to for-profit charter school companies who could then fire teachers and administrators at will with no accountability. Bryan’s bill has reportedly been through many drafts with no public input or discussion and could surface in the last days of the legislative session. It’s patterned after proposals in a handful other states and supported by right-wing foundations interested in privatizing much of public education. The grading system is part of setting the stage for the dismantling of low-income schools instead of providing support services for the students who attend them. The grades also reinforce the overwhelming evidence that poverty and educational achievement are closely linked. 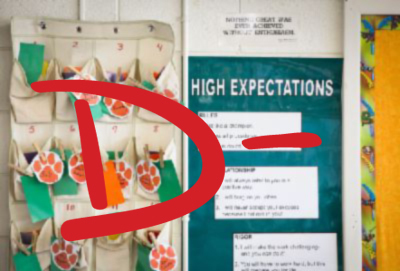 Embarrassing the schools and teachers trying to help poor students doesn’t help and neither does failing to recognize the students who are improving, but that’s exactly what the current A-F grading system accomplishes. It undermines a community’s confidence in the schools and makes it even harder to convince top teachers to take on the challenges the schools face. There’s not only a lack of incentive, there’s a professional price to pay for working with low income kids. Under the current grading system, you are branded as a failure. If Bryan has his way, you could be fired. There are other more productive ways to address the problems at the schools of course, most importantly helping the low-income students who are struggling. That means enough school nurses, counselors, and teacher assistants in the early grades. It means ending the waiting list for NC PreK so at-risk kids start school with a great chance to succeed. And it means helping low-income families too, reinstating the state Earned Income Tax Credit for low-wage workers, expanding Medicaid, and reversing the decision to kick thousands of children off the child care subsidy program that allows parents to work or go back to school. And it means injecting some commitment in the budget negotiations to adequately fund public education. The battle currently is whether or not to cut more teacher assistants after several thousand have already been cut. The decision about teacher pay is coming up with money to give many veteran teachers not a salary increase, but merely a $750 bonus. Not doing more damage to public education should not be the barometer of success this year. That’s another unmistakable message in the absurd A-F ratings, that many schools and many students need extra help. They don’t need more budget cuts or fewer TAs. And they don’t need to be stigmatized or privatized. They need to be supported—the schools, the teachers, the students and their families. They are not failing. The state is failing them.